Daffodil Lampshade On Mock Turtleback Base. 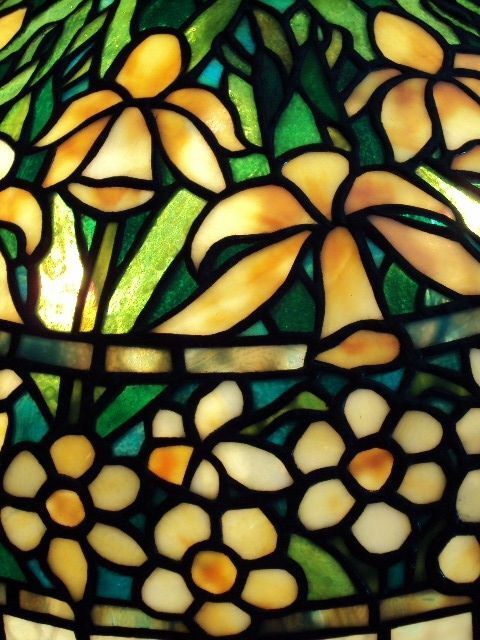 Reproduction of a Tiffany Jonquil Daffodil lampshade. This lampshade was constructed in stained glass using copper foil construction in the same way orginal Tiffany lampshades were done. The lamp was paired with a Mock Turtleback base with 3 light cluster. The base was made from solid brase that was copper platted and then finished with a green/brown patina. Lamp demensions 20" Dia. X 22 H.